Pauper Girl Parables: To Pay or Not to Pay? To Play or Not to Play?! The monthly $$ money $$ juggle takes its toll...after a while it gets downright depressing. Learning to rethink things you have always taken for granted – such as paying bills on time and having money left over for fun or dining out – is a necessity for many of us now as "leftover" money monthly has become an obsolete concept. Learning to navigate – or as I say juggle – the monthly bills is a fine art. When determining and prioritizing bills in 2010, I had some foreign encounters: disconnections of power and DirecTV, both at various times – oh, but which to pay and when? Of course, the power disconnect came unexpectedly at mid-day – noon exactly – on one of the hottest, most humid days in June 2010. Me? Chasing the power guy down to try to pay the bill in person after he rapidly disconnected me right outside my kitchen door at my power box and jumped in his truck to make a quick getaway. My dire dash was to no avail; "nothing" he could do. Health Care? Better Safe Than Sorry? The health-insurance-or-not dilemma? Hey, it was $419 per month out the door in 2010; may I say ridiculous for a fairly healthy person?! I changed the plan provisions and managed to lower it to $268 per month in 2011. Helps a bit! And we all know the month I cancel it, per Murphy's Law or in this case Ginger's Law, there will be a big need for it. Entertainment alternatives are pleasant discoveries, however. I found the Zen music channel on DirecTV – oh joy – when trying to unhinge the migraine vice that often crushed my head even before sunrise as I was attempting to “sleep” through all the crap. Netflix is a big favorite of mine; that I am keeping. So much cheaper and easier than driving to a DVD-rental location. I had Blockbuster for years and they will take you for every spare penny they can get. Maybe not now since they copied Netflix years ago, but sorry Blockbuster: it's too little too late. No wonder they are not doing well; Netflix swooped in a decade ago and alleviated the mad dash to return a video or DVD to beat the deadlines and accompanying fees for being even a minute late. Karma! Peace in the Fields – aka Llama Kisses...Sweet! Then there's the llama field, which provides me so much peace and comfort – au gratis, of course. Look for free things you enjoy, and do them. I am speaking of Larkspur Ranch outside Charlotte; occasionally, I go visit because friends have horses boarded there. There is an array of animals to commune with – cats, dogs, horses, llamas, a huge pot-bellied pig, you name it. I have two dogs – Koal, my Cocker Spaniel 10-year-old boy, and Karma, my nearly 1-year-old rescue girl (miniature retriever, the vet and I have determined, even though there is supposedly no such thing; but that she is) from Robeson County, NC's animal-control facility in the Lumberton area. 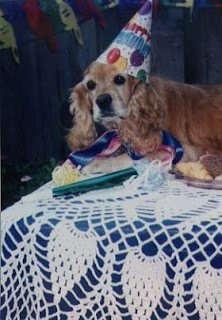 Let's just say every dog I have ever had – this includes my beloved Cocker girls Klaire and Snooky who are in heaven now – has had a paper fetish. Oh, the delight on their faces and speed of their wagging tails when they manage to unroll and salvage their “treasures” from the toilet-tissue roll to my discontent. There's nothing quite like prying open Cocker jaws – or Karma's power pucker – to retrieve and re-roll the infinite usable squares that have not made it into their paper-hungry little troughs quite yet, but were instead trailed throughout the living room. And it doesn't stop with toilet tissue; Koal knows how to open the kitchen trash bin even though it has a foot pedal, so I have to place a cactus on top of the bin. He and Klaire were and are also fans of napkins, Kleenex, magazines, you name it – all things paper. I guess maybe he had a fiber deficiency! ;-) God knows one day when left alone in the living room, Koal ate 27 pages of a People magazine, and it didn't phase him in the least! Oy! The joy of dogs! I and all my dogs have been big fans of Yummy Chummies ordered direct from Alaska ever since the early '90s. Well, my stockpiling of these tasty and healthy salmon morsels has ceased, at least for this year and last. The new treat du jour in my house, and one Koal has loved since he was a puppy, is – voila – free ice cubes or “icies” as we like to call them, delivered with a great deal of excitement to set the mood for these new "treats." Tail wagging aplenty! Bless Koal at times! ;-) No wonder he loves snow so much – when it snows, it's a virtual smorgasbord for him, and he lovesssssss it. Bone appetit – make that snow appetit! At the beginning of the worst and most depressed time of my life last May, what did I do? I rescued a puppy – Karma. Her name is no coincidence! Why? To save her life from a heartsticking animal-control facility, for my distraction and sanity, and to get me out of the bed daily. But a puppy? Now? What was I thinking?! ;-) Granted it was a month after losing the love of my life, Klaire, to liver disease after a successful two-year battle. Granted, Karma's rescue posting said she was one-year-old and a Cocker Spaniel mix. 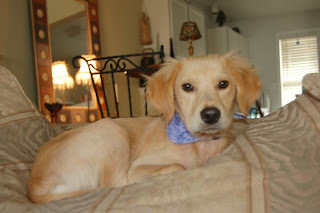 Hummm...I ended up with a three-month-old, terrified "miniature retriever." Her survival story is quite unique on its own. She came to me malnourished and with demodectic mange; she is now perfection! At this very moment as I type, Karmalita bonita is kissing me, and yes, right on the mouth. It took seven months to turn her into a secure and non-skittish love bug, but she did it! Kudos to Karma! 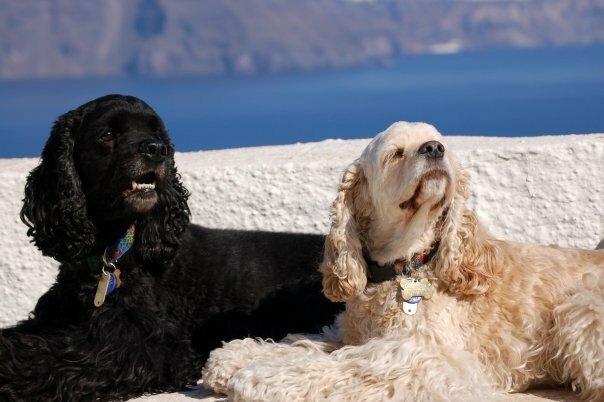 Koal and Klaire on the patio when we lived in Oia village, Santorini isle, Greece, 2006. Caldera in the background. 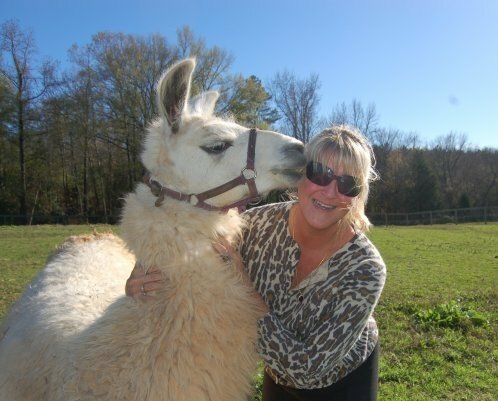 The llama and I at Larkspur Ranch, Charlotte, NC, November 2009. Snooky, my first Cocker Spaniel and the epitome of "party animal." 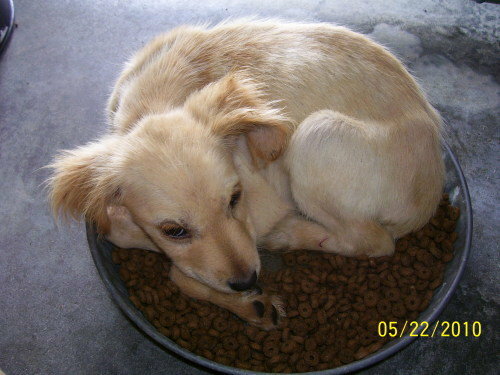 Karma, pre-Ginger's house while in the RCAS before I rescued her, May 2010. Karma at home, summer 2010. 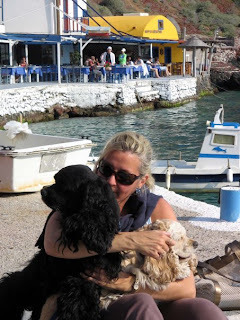 Koal, Klaire and I at Ammoudi Bay (the bay used in both "Sisterhood of the Traveling Pants" movies), my favorite little cove and bay and seafood tavernas in the world, about 400 steps down from Oia village, Santorini isle, Greece, June 2006. Perfection!